Goodbye Summer and all your sartorial challenges…….see you next June. I’m chomping at the bit to fully indulge my love of layering; A/W is most definitely my season. The old summer gear is barely away (laziness on my part), but dipping temperatures meant I had to to pull some winter woollies out today. Nothing new or inspiring, just some well worn and cosy favourites. I’ve yet to add to my A/W wardrobe (boots don’t count), and I’m not planning to add much as I’m aiming for a capsule wardrobe. But, I know there will be temptation everywhere so we’ll see….. Apologies for the hazy photo. 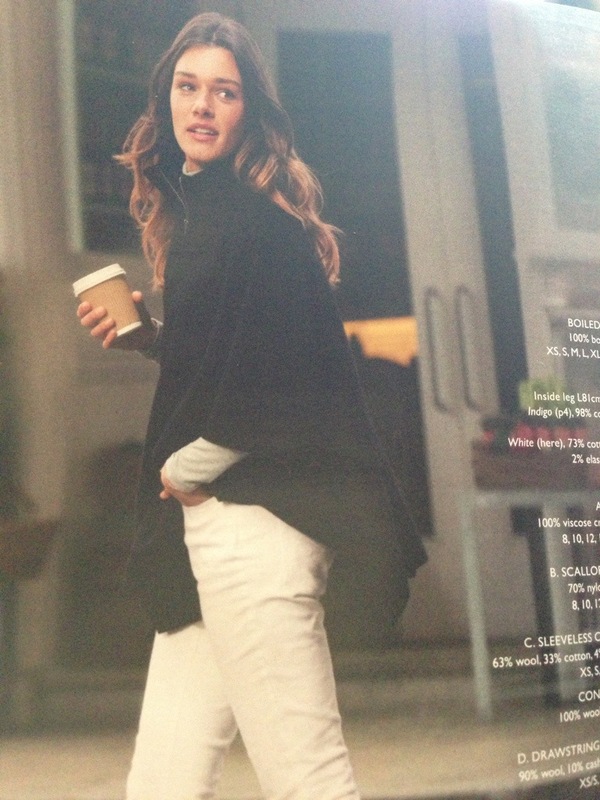 This entry was posted in Cos, H and M, Outfits, Rag & Bone, The White Company on September 12, 2013 by Jasmine WornOut. Honestly I know this may seem a little hard to believe but I’ve been having a few days where nothing I put on feels right. And going through last year’s spring/summer clothes – well I honestly wonder what I actually wore – oh yes an awful lot of white jeans. Am wearing with J Brand careys and my lovely new bag. I have a lilac silk shirt from Whistles which I also wear a lot and love the look of this Ida by Donna Ida one – perhaps one for my sales wish list. Out for supper last night to the lovely Methuen Arms in Corsham which I’d highly recommend and wore H&M cotton top, J Brand marias, Boden leopard clutch and bargainous Whistles burgundy sandals which were £45 in the sale recently. I really love the pale blue version but would happily take the coral version too but at £365 – its a definite wait until the sales buy. I sense a White Company order coming up. And today for some pottering round the garden its neon Gap tshirt with old Hudsons which is the closest I get to a boyfriend jean. I loved how Sarah looked in hers but know for me its a look that just wouldn’t work unless I suddenly grow a foot that is. This entry was posted in Boden, Donna Ida, Equipment, Isabel Marant, J Brand, Outfits, The White Company, whistles on April 21, 2013 by TraceyWornOut. I’ve got a new style crush. Well its not exactly new as I’ve always really loved Jennifer Aniston’s style but seeing this photo of her today – oh how I want that top. Now thinking of Jennifer led me onto sunglasses and specifically Tom Ford ones. I wear my Jennifer ones pretty much everyday as they are so light and comfortable and the brown works well on my pale skin. But I recently tried on the matteo ones and loved them. They’re more aviator in style and were very flattering on. I also fancy a pair of Whitneys which are basically just a slightly larger version of the Jennifers. If only my budget was as large as my wish list. So another lovely day here albeit rather blustery. I actually rather love this type of weather as it means lots of boots and jackets – two of my favourite things. So here I am wearing Rag & Bone jersey jacket, White Co top, Lily & Lionel scarf, J Brand careys and Office keepsake boots. And of course Tom Ford Jennifers. Sorry I know the photo is rather blurry and have just realised I’ve chopped my feet off. Ooops. This entry was posted in J Brand, Lily and Lionel, Outfits, Rag & Bone, The White Company and tagged Tom Ford on April 18, 2013 by TraceyWornOut. OK so you need to allow a little bit of artistic licence but I like them with slightly cropped jeans and a spring coat – both of which I already have. So what do you think? and am rather taken with them. They look a bit like my Swedish Hasbeens and I think would get lots of wear this summer – to be honest they are a much more practical buy for me than white stilettos. But wonder how it would look without the windswept effect – I may have to venture into my local store for a try on session. However I would never buy in store as there’s always 20% off codes floating about online. But anyway, the pretty things above are just mere diversions from the bag I have fallen in love with. And oh how I want it. Its the Marc by Marc Jacobs too hot to handle hobo in lipstick red and it would work so well with my wardrobe. So I’m busily ebaying in an attempt to fund it oh and anyone else who ebays – hope you’ve all realised Royal Mail postage costs have gone up a lot so increase your p&p accordingly. The jeans are the River Island khaki ones which are currently reduced, J Crew denim jacket, old Breton top and Jigsaw scarf. Yes I know its the Zara coat again. And yes I’m sick of it too but its cold so out it comes with Anya bag and the Jigsaw scarf. But look a white jacket – and yes I froze in it and had to shove uggs on when I got home but for a little while I looked like I was dressed for a spring day. The shirt and jacket are both old Topshop and the bag is a very very old LV one. It nearly ended up on the ebay pile but got a last minute reprieve based on the fact it would probably only get buttons and my daughter may like it when she’s older. Hey don’t I sound just like Tamara Mellon who archives her wardrobe for her daughter. Not sure we’re in quite the same league though. This entry was posted in J Crew, Jigsaw, Marc by Marc Jacobs, Outfits, Swedish Hasbeens, The White Company, Topshop, Zara on April 5, 2013 by TraceyWornOut.